Now that the power of attitude on performance for both male and female players has been established, coaches need to identify strategies that reinforce that process. To help coaches and players appreciate the need to place attitude training at the heart of their work, I have created a complete player profile. Positive relationships can act as the glue that cements players and coaches to the cause and binds them together as a team. Renowned sport psychologist Bill Beswick shares mental training techniques he developed for England’s Premier League—building mental toughness, fostering team cohesion, and visualizing success. As he establishes the theory, Bill provides examples and case studies from teams such as Manchester United, Middlesbrough and The England National team. Step onto the pitch focused, confident, and positive. Walk off a winner. In the first edition of Focused for Soccer, internationally renowned coach Bill Beswick uncovered the power of sport psychology for soccer players and coaches worldwide. Now completely revised and updated, this new edition cements its status as the essential guide for mastering soccer’s mental game. Focused for Soccer emphasizes playing first with the head, then with the heart, developing decision-making skills, and keeping emotional responses in check. The practical tips, examples from top Premier League teams, and step-by-step techniques will help sharpen your skills and unleash your potential. All aspects of the mental game are covered—from concentration and visualization techniques to building mental toughness and team cohesion. Featuring the latest coaching strategies for male and female players, match preparation, and communication, Focused for Soccer is your complete guide to a winning attitude and soccer success. 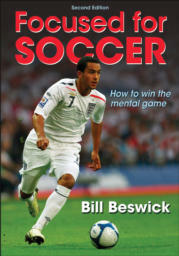 Bill Beswick is a leader in the field of sport psychology and is especially known for his work with professional soccer teams. He has a master’s degree, five years of experience as head coach of England’s men’s basketball team, and substantial experience in teaching, lecturing, and coaching, all of which make him ideally suited as the first full-time sport psychologist in English professional soccer. From 1996 to 1999 Beswick helped Derby County Football Club compete in the world’s toughest league, the English Premier League. He then took a job with Manchester United, perhaps the world’s best-known soccer club. There he worked with players and coaches to build mental toughness and competitiveness in an environment where the team is expected to win every time it takes the field. When Manchester United and England assistant coach Steve McClaren was appointed manager of Middlesbrough Football Club in 2001, he surprised the soccer world by appointing Beswick as his assistant manager, the most senior role for a sport psychologist in the history of British soccer. For five seasons Beswick supported McClaren during Middlesbrough’s most successful period in history. From 2006 to 2007 Beswick was psychologist with England’s national men’s team. Following a spell at Sunderland FC, Bill at present provides specialist advice to clubs in England, Holland, and the United States while continuing to develop Sportsmind Ltd., a company that has provided sports psychology services and resource materials to coaches and athletes for more than 20 years.